Family Feud 3 Game, is one of 300 free games you can find at Free Ride Games. This game based on the successful TV game show calls on you to guess what 100 people said when they answered our survey questions. Their sometimes surprising, often hysterical answers await in Family Feud: Dream Home, the latest sequel to the popular series. Play against the average score, or challenge a friend in 2-player mode. Play Family Feud 3 Game for free!! ...... Modern and neutral, or teeming with color - it's up to you. 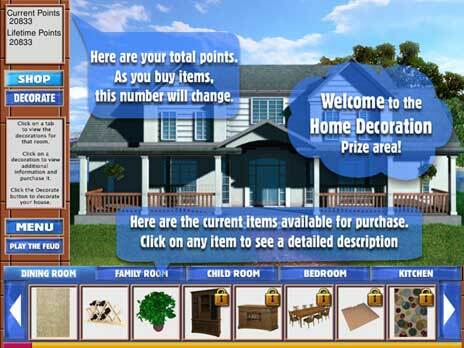 With almost 3000 questions and a home decorating feature, hours of fun included. Free Ride Games is the only place where you can download over 300 top games for free, including Hidden Object games, Time Management games, Match Three games, Sports games, Puzzle games, Arcade games, Card games, Board games, Flash games, Fashion games, Food games, Online games, Word games and much more. We have hundreds of choices from the leading game publishers like iWin, PlayFirst, Sandlot Games, Mumbo Jumbo etc. Qweas is providing links to Family Feud 3 5.0.1 as a courtesy, and makes no representations regarding Family Feud 3 or any other applications or any information related thereto. Any questions, complaints or claims regarding this application Family Feud 3 5.0.1 must be directed to the appropriate software vendor. You may click the publisher link of Family Feud 3 on the top of this page to get more details about the vendor.